Remember when beanie babies were the the "thing?" Well, this costume will bring back memories and everyone will enjoy some good laughs. 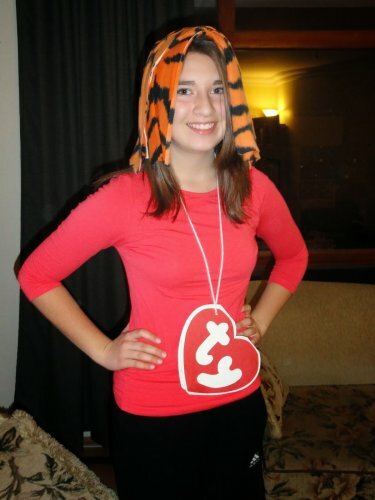 Supplies: animal ears or hat (or in my case, mop head), white poster paper, red paper, and shirt that co-ordinates with the beanie baby animal you chose. Fold the poster board in half and cut out a heart (be careful not to cut the fold). Cut the red paper in the same shape as your poster board heart and cut out the letters "ty" from the center. Inside of the heart, you can include your name, birthday, hobbies, barcode, etc. Hole-punch the top of the heart and string a piece of yarn through it so that it can hang around your neck. 3. Wear your coordinating shirt and pants.